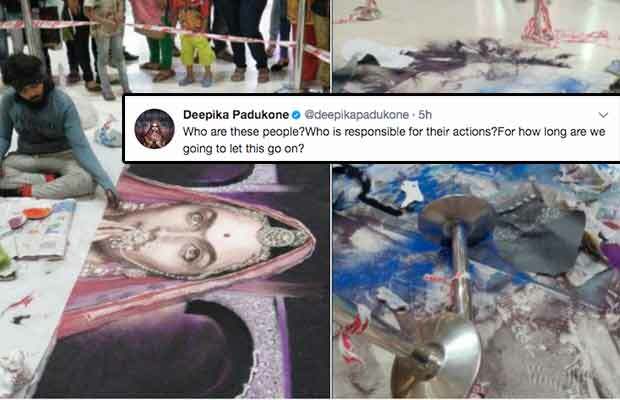 Padmavati Rangoli That Artist Took 48 Hrs To Make DESTROYED, Deepika Padukone Lashes Out! A rangoli of Deepika Padukone as Rani Padmavati from her upcoming film ‘Padmavati’ was recently destroyed by a group of protesters in Surat. The rangoli that took 48 hours to make was destroyed in no time. The artist, Karan K took to Twitter describing the incident. Finally, Deepika Padukone has reacted to the same and also makes sure that this reaches till Smriti Irani. The actress took to Twitter and expressed her anger over the same. To people who don’t know, the controversy against the film started after the members of a Rajput group, Karni Sena, protested against Padmavati for alleging distorting historical facts by the filmmaker. The shooting of the film was stopped in Jaigarh fort while director Sabbath Leela Bhansali was physically attacked, which had triggered outrage in the film industry. A few months back, the state minister of Rajasthan had made it clear that the film will not be released in Rajasthan till it is shown to the Rajput community leaders. While the movie’s trailer is receiving great response from the audiences, the fear still looms for the makers of the film. Starring Ranveer Singh, Deepika Padukone and Shahid Kapoor in the lead roles, Padmavati is hitting the screens on Dec. 1. Previous articleEXCLUSIVE Bigg Boss 11: Arshi Khan’s Spits On Hina Khan, Here’s How Housemates REACTS! !